This is the CraftJam you’ve been waiting for! Get ready to make your new favorite leather clutch, customized with your initials! This is the ultimate girls night CraftJam, and you get to strut home with a stylish clutch, just the way you like it. In this CraftJam we work with vegetable tanned leather - known for making beautiful and durable leather items. You’ll be surprised how simple it is to make your clutch, using our specially created pattern, that requires no sewing. In just 2 hours you will have created a beautiful, self-styled, custom clutch! For this event we are partnering with ad hoc | collective, a cozy coffee shop selling fresh brewed coffee from Portland Maine. ad hoc | collective is a quaint independently owned coffee shop with amazing vintage finds. Take care of your final project. 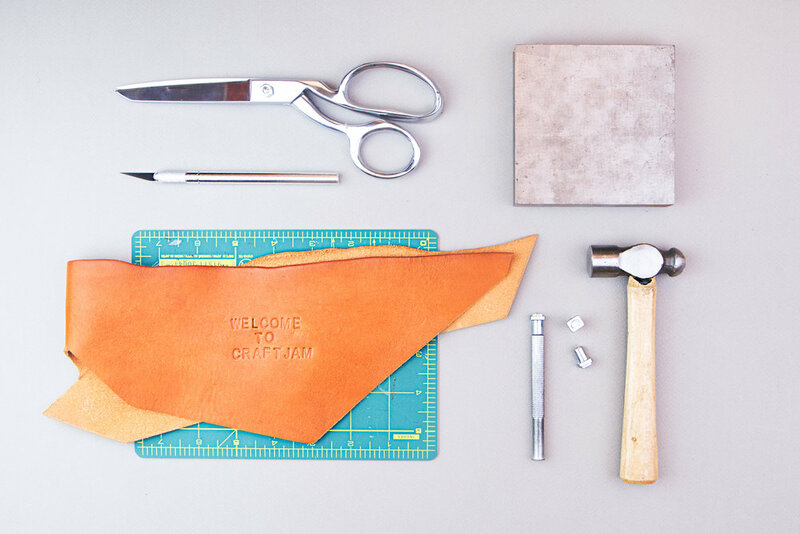 We’ve got all the materials you need, including an assortment of leathers, all the right leather crafting tools, and a leather stamping station. BYOB – crafting is paired best with your favorite drink of choice! CraftJams are hosted in an intimate setting with twelve attendee maximums. Make sure to purchase your ticket before the event is sold out!